Location. 40° 9.695′ N, 82° 52.75′ W. Marker is in Gahanna, Ohio, in Franklin County. Marker is on Sunbury Road. Touch for map. Marker is at or near this postal address: 5847 Sunbury Road, Columbus OH 43230, United States of America. Touch for directions. Other nearby markers. At least 8 other markers are within 4 miles of this marker, measured as the crow flies. Benajah Cook Sawmill and Farmstead (approx. 3.1 miles away); Sharp Family Homes (approx. 3.4 miles away); The Alkire House (approx. 3½ miles away); Clarence Boal Hoover / Charles Potter Hoover (approx. 3.7 miles away); Galena (approx. 3.7 miles away); Heritage Green Park (approx. 3.7 miles away); Westerville (approx. 3.8 miles away); Agnes Meyer Driscoll (approx. 3.8 miles away). More. 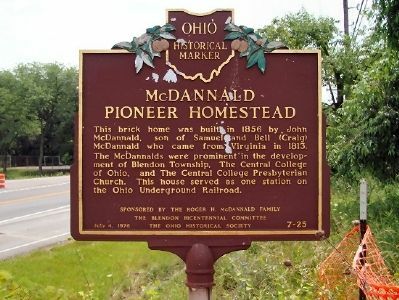 Search the internet for McDannald Pioneer Homestead. Credits. This page was last revised on May 12, 2018. This page originally submitted on January 23, 2012, by Mike Meinhart of Gahanna, Ohio. This page has been viewed 656 times since then and 23 times this year. Photo 1. submitted on January 23, 2012, by Mike Meinhart of Gahanna, Ohio. • Bill Pfingsten was the editor who published this page.